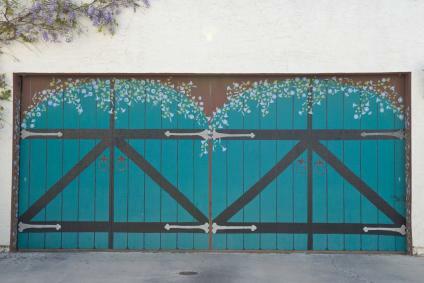 This Trompe L'oeil mural painted on a garage door looks like barn doors. Trompe L'oeil is a French expression meaning "to deceive the eye." In design, Trompe L'oeil is a realistic wall mural that is painted artistically to create the illusion of three-dimensional scenes, faux textures or objects. Trompe L'oeil style paintings and faux finishes are not just limited to walls. 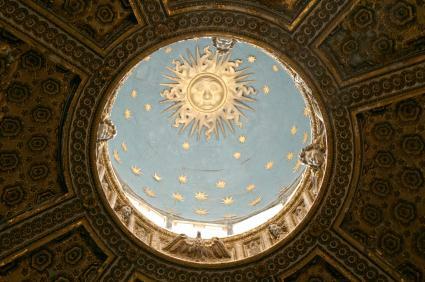 You can find ceilings and floors adorned with the realism of trompe l'oeil, in addition to doors and even furniture. Almost anywhere you have a paintable surface, you can have a trompe l'oeil style finish. This includes the decorative wood trim around the ceilings and walls and in or around arches and alcoves. On interior walls of the home, a trompe l'oeil mural can add a sense of open space where, in reality, there is only a wall. A trompe l'oeil mural featuring a lush, tropical beach scene can turn an ordinary bedroom into an exotic tropical retreat. The mural can be used on an artistic accent wall or it can continue on to other walls in the room. In a small bathroom, the far wall can be painted to look like the room opens out into a small courtyard or a secret garden. A serene scene would also enhance the space behind a large Roman tub. In the kitchen, a well placed trompe l'oeil painting can create the illusion of a quaint little wall alcove with a rustic Tuscan urn or planter. It could also be used to create the illusion of a stone backsplash. Open the faux shutters of an imaginary dining room window, which looks out into a sun kissed field of lavender in the French countryside. Or surround the room with an elegant grapevine border near the ceiling. An artistically painted ceiling can give the illusion of a glass, greenhouse style roof through which one sees a bright blue sky with a few cotton-like clouds and birds flying overhead. A cement floor can look like stone or terra-cotta tiles. The wood trim and crown molding in a room can be transformed into marble, with marble columns appearing where there were none before. A realistic checker board can be painted on a tabletop, looking so real you might sit down for a game of checkers. Cabinets and dressers can be embellished with feminine floral designs. While an authentic trompe l'oeil mural or finish is painted by an artist, thanks to modern technology, there are other ways to achieve this look in your home. A trompe l'oeil style painting or mural can be made into wall coverings that are very similar to traditional wallpaper. You can find designs by well-known artists such as Yves Lanthier, a Canadian artist who has been creating trompe l'oeil murals in numerous mansions on the East Coast, including Celine Dion's estate in Jupiter, Florida. Lanthier's trompe l'oeil style wall coverings on canvas are called Giclee and professional installation by a wallpaper installer is strongly recommended. Design Your Wall- Here you will find a variety of wall coverings in both modern and traditional designs, including works by famous artists like Christian Riese Lassen. Installation guidelines are posted on the site. Couture Deco- This site sells modern style trompe l'oeil wall coverings on fabric. Coverings can be nailed, stapled or glued in place. Naturally, nothing can compare to having the real thing. 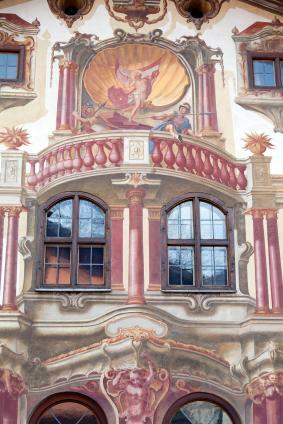 If you can afford it, hiring an artist to create a unique trompe l'oeil mural in your home is a worthwhile investment. An authentic trompe l'oeil mural should be treated like a piece of fine art, because that's what it is. While you can certainly paint over a mural in the future, why would you want to? Except in the case of a child's bedroom, a hand painted trompe l'oeil mural is something you should plan on keeping for a very long time. With this in mind, you should choose the location and the design very carefully. Whether you install a trompe l'oeil wall covering or hire an artist to paint a mural in your home, a trompe l'oeil style mural will add a touch of fine art, elegance and creativity to any space.